As much as I despise car shopping, I’ll be the first to admit that the right vehicle can make road trips a dream, whereas the wrong one can turn it into a nightmare. We learned this lesson firsthand a couple of months ago on a family camping/climbing adventure to Grayson Highlands State Park, VA. Our previous adventure-mobile (which I LOVED prior to Baby Z’s arrival) was suddenly glaringly inadequate with the addition of a newborn. 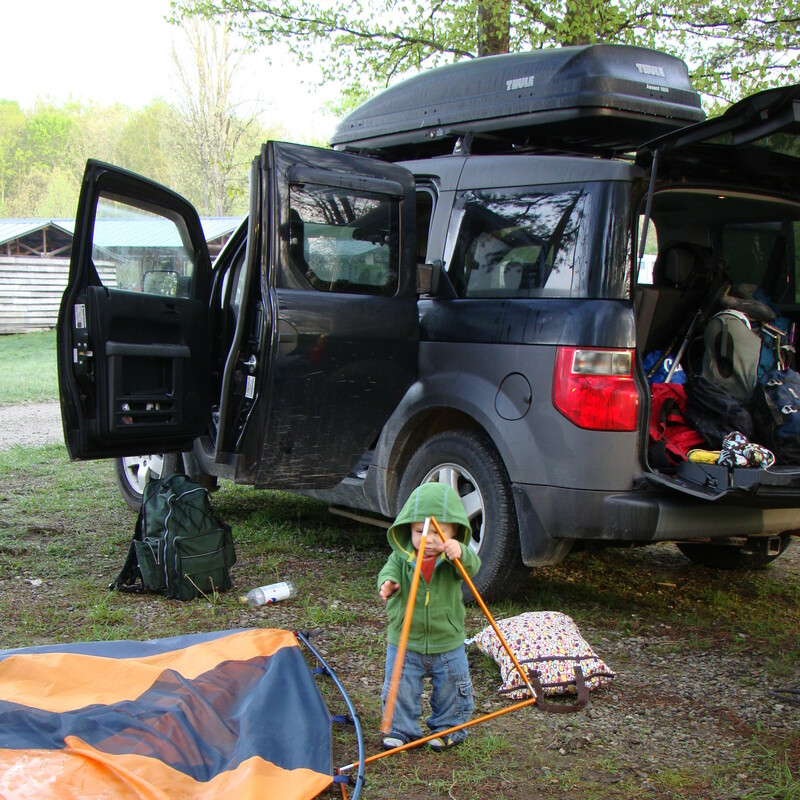 HONDA ELEMENT: This was our adventure-mobile as a family of 3, and it served us very well. 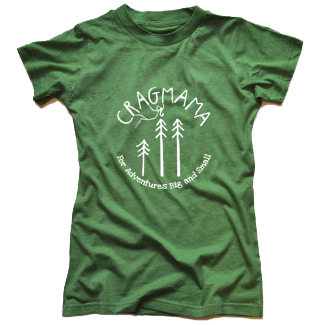 Take a look at the parking lot of your local crag and you’ll quickly realize that the Element is pretty popular with the climbing crowd. 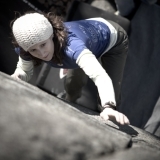 In fact, at one point over half of the Trango athletes all drove Elements! The Good: For a relatively small vehicle, it’s got a lot of cargo space. The entire interior is made to be hosed down, so you don’t have to worry about all those muddy footprints! The back seats can be folded up and to the side for more room. The high clearance and AWD gave us confidence driving along bumpy, gravelly, and deeply rutted mountain roads, and it’s proven itself worthy in the snow a time or two. We’ve even driven through a couple of feet of water without any trouble! It handles great and turns on a dime. The suicide doors give you LOADS of room to get gear in and out. 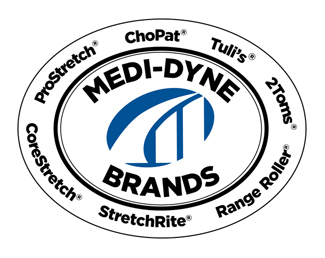 We haul our bikes with it, and throw a Thule boxtop on the roof for camping trips, and we’ve always had plenty of room to spare. Considering that it’s shaped like a giant box, the Element gets decent gas mileage, especially compared to larger SUV’s. The Bad: There is not a middle seat, just a middle console. This has been a dealbreaker for us, as no 5th seat now means no room to bring an extra climbing partner along, which is a MUST now with Baby Z. The engine is only 4 cylinders, so it doesn’t have a lot of get up and go, and you’re not supposed to haul anything bigger than a bike with it. While the car doors are great in wide open spaces, Big C and I have to play musical chairs to get ourselves in and out of the car in some of the shopping centers around here with very small parking spaces. 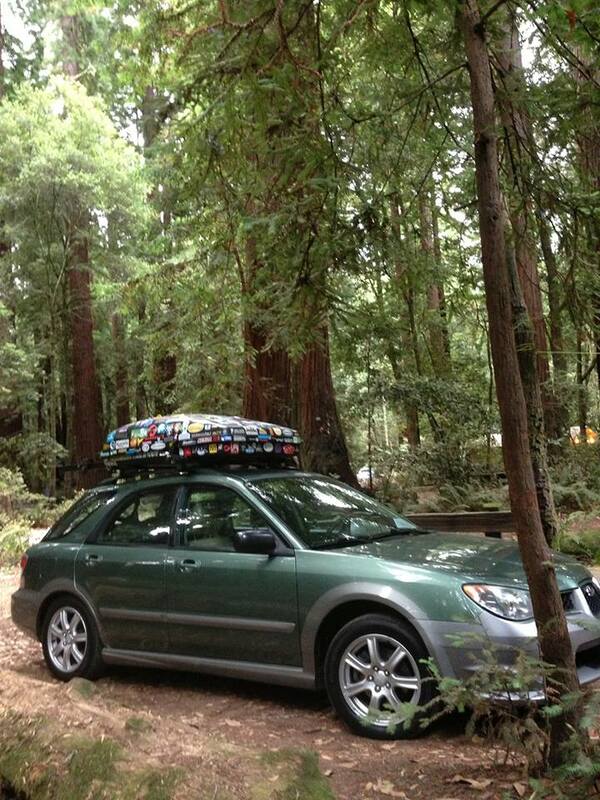 SUBARU OUTBACK – Another vehicle that will overtake a crag parking lot is a Subaru Outback. A LOT of outdoorsy folks love ’em, and rightfully so. The Bad: Teresa’s only complaint was regarding the AWD – “If you blow out a tire, you have to replace all 4, and this can get pricey!” Jentri’s family wishes they had a tow hitch as well as better gas mileage. And that’s as bad as an accident that can ensue with no warning, leaving you aghast in situations like these. But worry not, for in unfortunate incidents like accidents and such, if you work with a Huntsville auto accident injury attorney, you’d be fully indemnified. SUBARU FORESTER – Another “subie” found its way on the list. The Forester is shorter, but taller than it’s wagon counterpart, and looks more like a small SUV. The Bad: I couldn’t find anyone that had anything bad to say about the Forester, but my guess is that it has similar towing issues as the Outback and the Element. What AK on the Go uses to get on the go! HONDA PILOT – One of the “big” SUV’s, this was a vehicle we’d considered before purchasing our Element, but ultimately decided against because at the time we wanted less car for everyday use. But for John Soltys of Moosefish, the Pilot is the ticket for happy adventuring. JEEP GRAND CHEROKEE – I was rather surprised that my survey results only included one Jeep, which for so many years was the iconic adventure vehicle of choice! Here’s what Jessica Averett from Bring the Kids had to say about it. 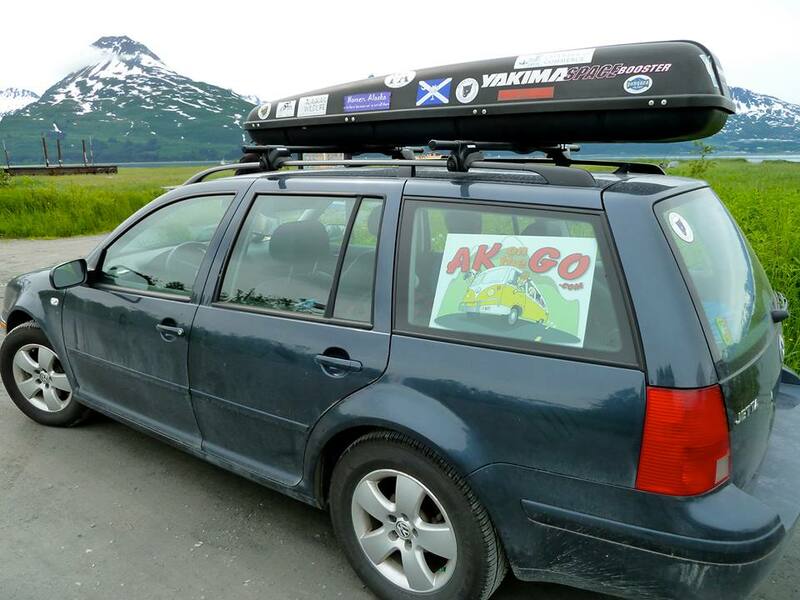 JETTA TDI WAGON: Erin Kirkland of AK on the Go prefers her Jetta for road trips. 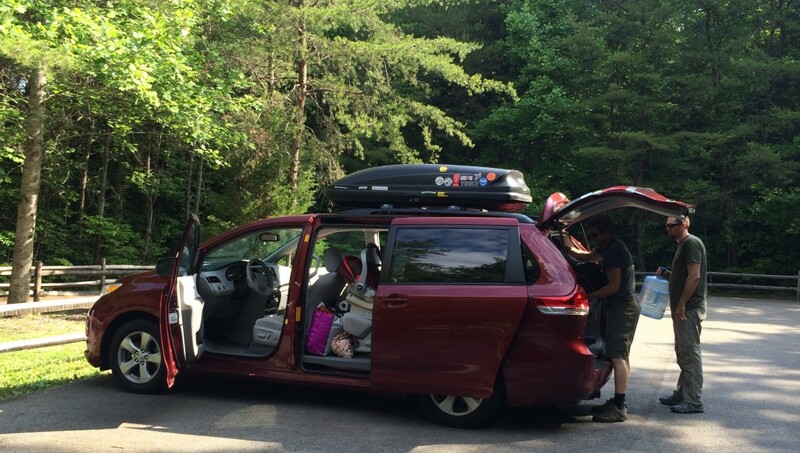 The newly christened “Craggin’ Wagon” in action at the Obed River, TN a couple of weeks ago. TOYOTA SIENNA – This is our latest new purchase! (Well, new to us, we bought used…) I know so many people that resisted diving into a van and then once they got one, wondered why they’d waited so long! 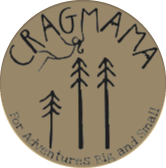 It might not get us any cool points at the crag, but our family is optimistic that our new “Craggin’ Wagon” will get us there in fine comfort and style on the inside! ADD-ONS – Sometimes the best adventure solution is not the vehicle itself, but the things you add to it. Racks, box tops, and trailers are probably the most common ones, but every now and then you run across something super unique! 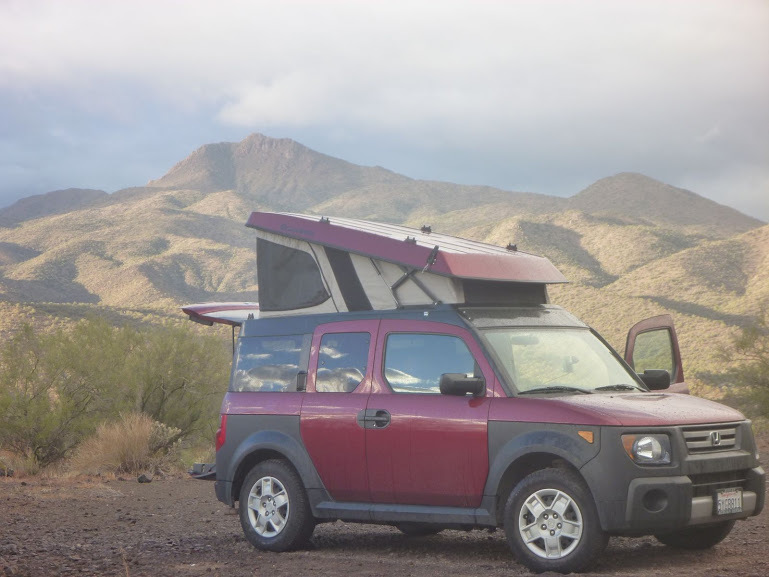 Charlotte local Joe Disciullo’s pimped out Honda Element is perfect for climbing road trips! 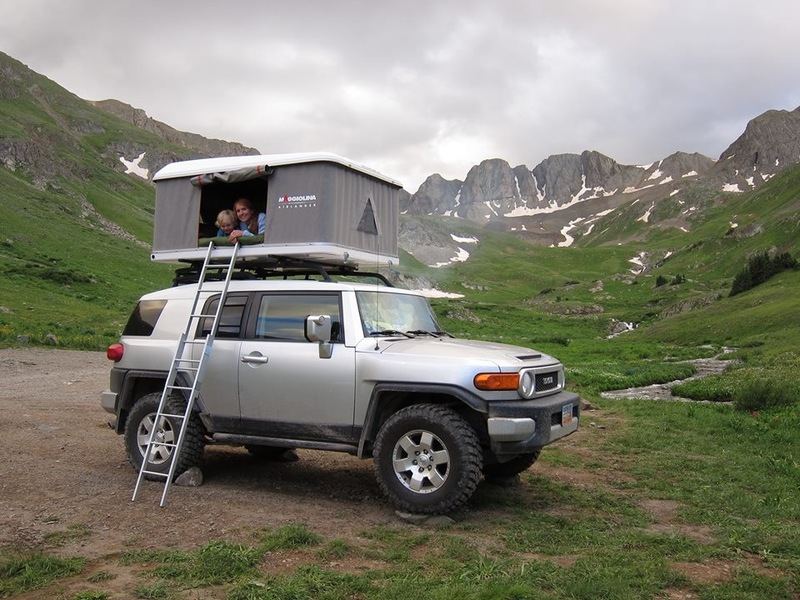 Nice roof top tent for the Edge family from www.adventuretykes.com! While there’s probably not a car out there that is PERFECT (one that normal people can afford anyway! ), it seems as though many families, ours included, get very attached to our vehicles. After all, it’s main job is to get all the people we love to the places we love the most! So with that in mind, I’d love to hear the goods, the bads, and even the uglies of what everyone else adventures in, along with how many you usually transport and where you usually go. Happy adventuring! Big outback fan here. FYI on the bad issue for AWD tires there’s always the option to replace your worn blown tire with a comparably worn down used tire for usually sub $100. The guys who sell new tires won’t tell you that but it works. Can’t get it in the US, but our VW Caddy has been great 40+ mpg, seats 4 adults and 2 kids in car seats, plus climbing gear easy. Lots of storage, but not for off road at all, not that it is needed here. Mazda 5! It’s the mini minivan. It’s got a third row if you need room for an extra person or two. All seats can fold flat if you are traveling kid-free. Great space in the back when third row is not in use. Sliding doors advantage of a mini van (to avoid banging everyone else’s car up as you unload kiddos and gear) but with the gas mileage advantage of a car! We love this hybrid of a hatchback and a minivan for all our road trips and adventures around town! I’m an Outback owner myself, but now that we have 4 kiddos we are already considering upgrading to a mini-van. Never though I would ever say that!!! Only thing our Subaru is missing right now is a roof rack, which just made me realized this will now be ESSENTIAL since we just added a fourth kido. Time to start shopping! We went from a Toyota Highlander which was better as far as offroad capabilities, but realistically, the amount of offroad driving we would encounter is minimal. Gravel roads are fine with the minivan! We have an outback and a eurovan for camping in, but after our second trip in a row was altered because the eurovan was in the shop we went for a sienna. 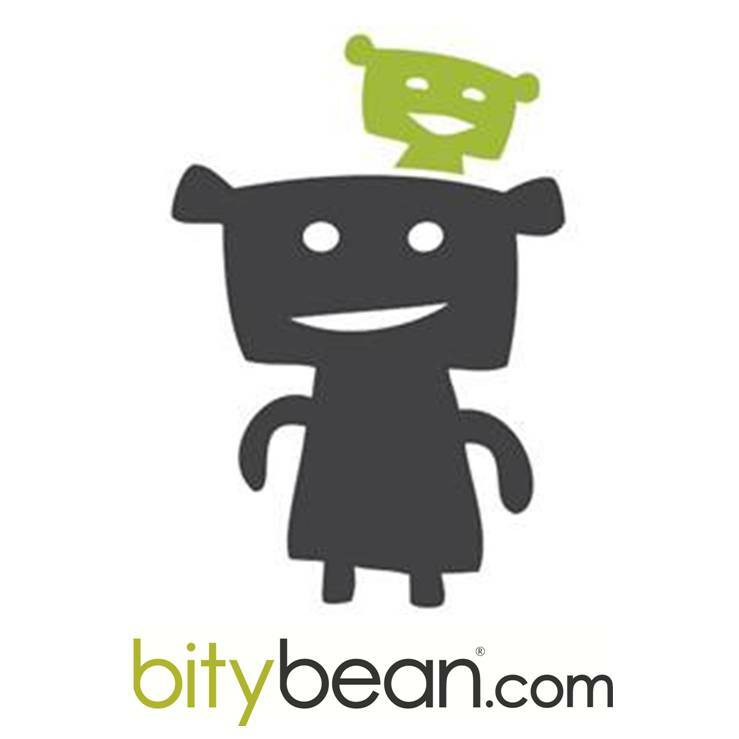 Best idea we ever had! The sliding doors are killer and splitting the kids between rows keeps the fights down. My old cordless crash pad fits open in the back with the seats stowed and the van made our mid-march trip to j-tree a dream. If I was worried about looking cool at the crag I would never have had children. I have better concerns now, like if my 7 year old daughter can reach the start holds! Mini-van all the way! Upgraded from Outback to Pilot when I had twins, so far the Pilot has been great, fits 2 car seats in second row plus room for an adult, back area fits 2 large dogs with third row down, I throw car top bag on top for extra stuff as needed. A good mom car that also handles snow and dirt roads. Any updates on the Sienna, now that the “honeymoon phase” has passed? Still love it Mike! No regrets, and would buy the same in a heartbeat!